Things people make to put somewhere on their bodies, from head to toe. For things you put on animals, you might like to look at the tack category. 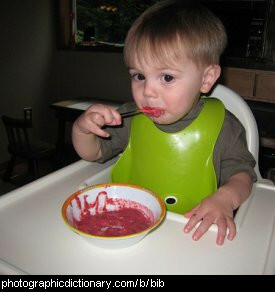 An apron is a garment that is worn over your other clothes to protect them. They are most often worn for cooking and washing dishes, but are used in many other professions as a protective garment. 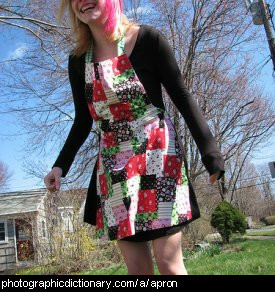 carpenters and butchers are often seen in aprons. Armour is a covering for a vehicle, animal or person that protects them from damage. 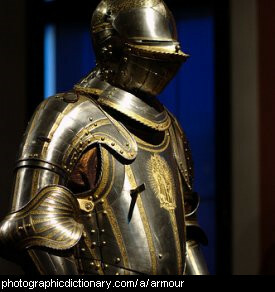 Armour can be made from metal, leather, wire in the form of chainmail or even wood. Modern armour, such as flak jackets or bulletproof vests, are made from ballistic cloth. 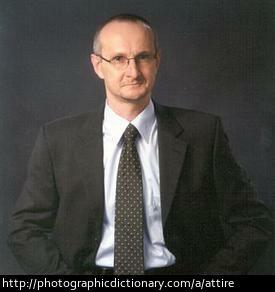 Attire is more formal word for clothing that is for a certain occasion, such as business. 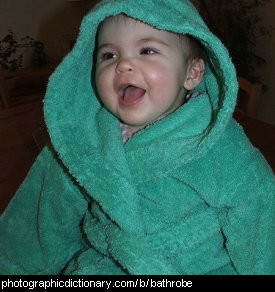 A bathrobe, or dressing gown, is a garment that you wear around the house. You usually wear a bathrobe after you have had a bath or shower, or just to keep yourself warmer when you are only wearing your pajamas. A bikini is a women's suit made for swimming in that is in two pieces. A blindfold is a piece of cloth that someone else ties over your eyes so you can't see. People are often blindfolded so they can be lead to a surprise without knowing where they are going. Some games require you to be blindfolded, like pin the tail on the donkey. 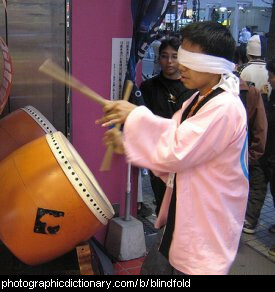 The person in the picture is playing a video game blindfolded. 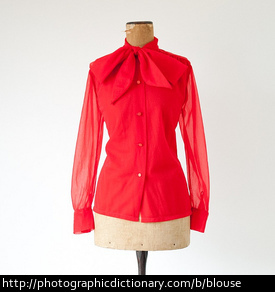 A bra, short for brassiere, is an undergarment worn by women to cover and support their breasts. 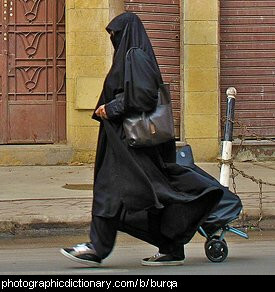 A burqa is a garment worn by women that completely covers them. It is worn for religious or cultural reasons, and is only worn when the woman is outside the privacy of her home. The veil part of a burqa is called a purdah, and may cover her entire face or just the part below her eyes.